• Size: 6" 8" 12" 15"
Owing to the wide experience of this domain, we are instrumental in offering Cable Organizer. 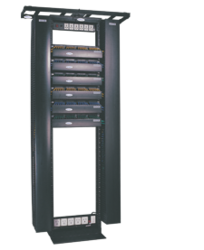 High density Cable Organizer, specially designed to meet the challenges of high density cable management due to increase on of path panel per rack and also introduction of angular jack panel. Beautifully useful. The Universal Expert Cable Collector keeps computer and charger cords tidy in simple cork. 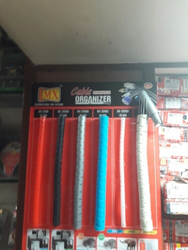 - MX easy clip cable organizer is Easy to install. - MX easy clip cable organizer has Good quality. - MX easy clip cable organizer will remove the cable mesh. - MX easy clip cable organizer is Useful in home and office. Versatile electronics accessories organizer specifically designed for well-organized people. Serves as a commute checklist. Before you leave a place, just open the case and check if the whole thing is there, preventing you from leaving things at the back of. • Composite construction basic frame-Steel powder coated and fingers made of Poly carbonate for high strength to carry large quantity cables. • Cable Spools and Slots in Centre supported Member for large quantity cable management. • Poly carbonate fingers assure no cable damage. - Manufactured out of plastic. - This unique design has 3 port selection to suit different number of cables. - Available in Black, Ivory and Grey colours.